Today I am showing you one of many options when making a Masculine Card. Perfect for Father's Day! 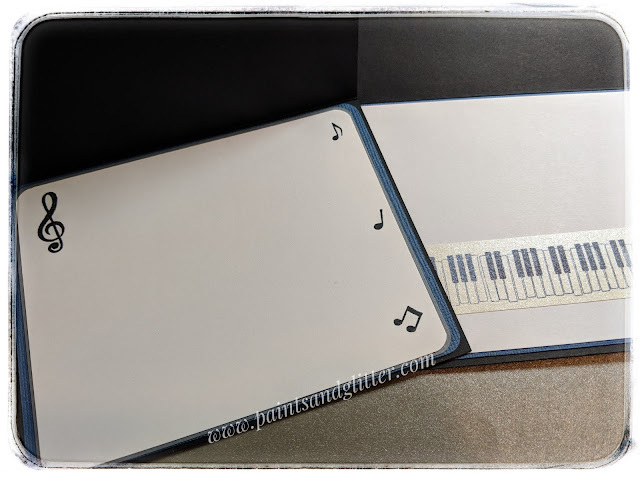 I have made this tutorial easy, and you can tailor the cards to suit your needs. If you're anything like me, you likely have many supplies right at your fingertips that you can easily substitute for the ones I've used. I began with a primary-color palette. This is always the easiest route to take when making masculine cards. Save the frilly colors and textures for the girls! 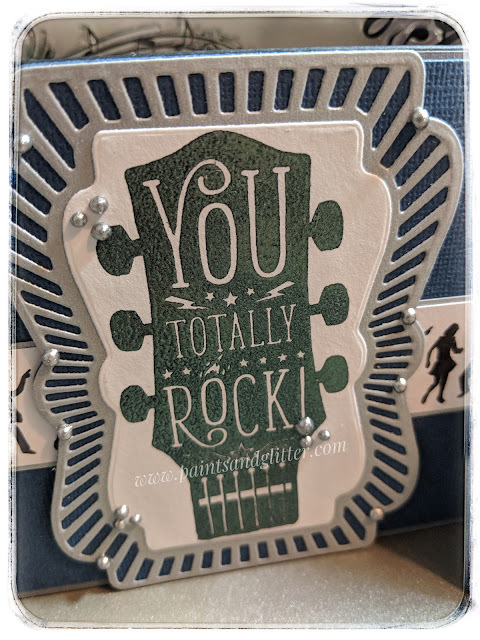 For the front of my card, I first stamped the Guitar image in Ranger Archival ink in Black, followed by heat embossing in Green embossing powder. If you can't bring yourself to use dark colors, or simply don't have them, don't fear. Give those light-colored papers some masculine touches by either adding a wood-grain, or cutting shapes that can be interpreted as having a masculine touch on your cards. This gorgeous guy got all his coloring from Tim Holtz Distress-Oxide Inks. 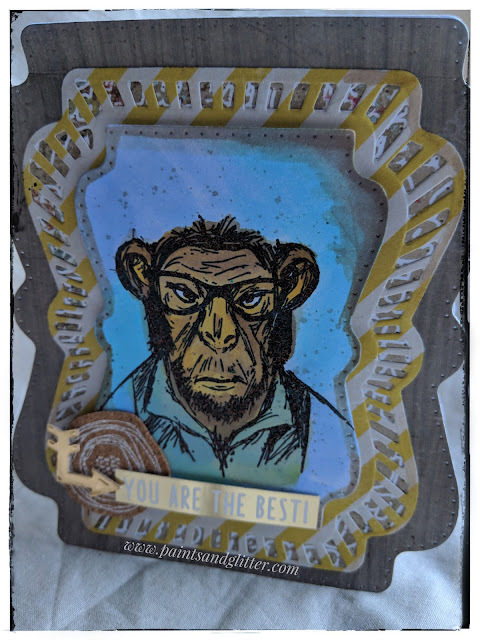 He is also embossed in an awesome copper tone! I used Cricut Pearl paper, which is shimmery and soft in color. 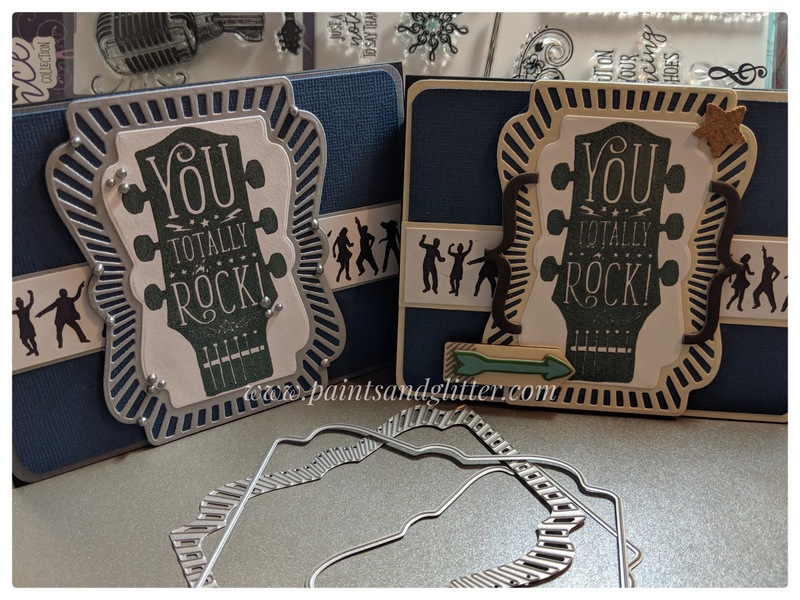 The difference: I cut it with my Tonic Memory Book dies, in a shape that echoes the shape of my stamp. Graphics can change everything! 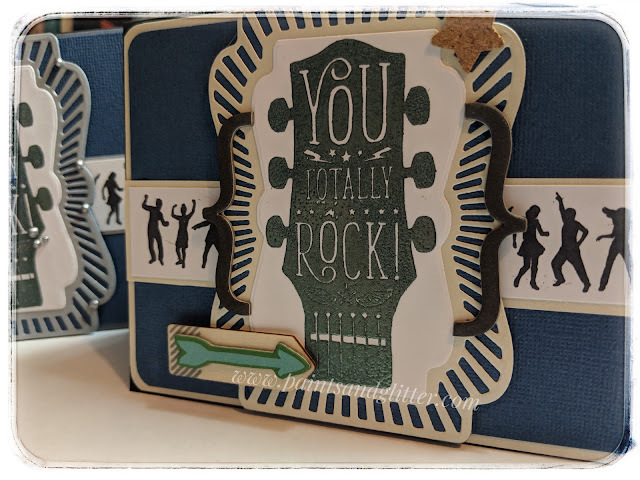 These cards also have a touch of fun, but it's not the focal image. I used Sheena Douglass stamps, and the dancers are stamped in a matte black. The only shine here are the added enamel dots. This still allowed me to keep my card classy and elegant. Not dainty. I added other touches on the inside, and made sure to leave room for a message. What sets these cards apart: Triple matted inside layers, which echo the textures the front of the card has as well. Follow my Video instructions if you like, and let me know what you like about these cards, or if there's any other type of card you feel challenged with. I am happy to show you what I have learned along the way! !